Greg: Jason, we’re back another episode of your podcast. How are you? Jason: I’m doing well. I can’t believe another week has gone by. Greg: I know. We’ve learned a lot about kitchens lately and some other parts of the house, but I want to follow up on some Instagram posts I saw of you recently. Looks like you went on a field trip or two. Jason: Well, you know, part of what I do is constantly doing some research and had the wonderful opportunity to go to Charlottesville, West Virginia to tour the 2015 southern living idea house. Greg: Is there one every year? Is it always there? Jason: Well, there’s usually one every year. It’s throughout the south and it’s a very half feature in southern living. It usually gets 20-30 pages of print and a lot of attention. It’s kind of like they’re trying to set the trends for the future of home building. Greg: I think I’ve heard about this in different cities. Maybe Atlanta … is it all around the south or is it typically in one city? Jason: Yeah. It’s all around the south. It was in Nashville a few years ago and it was in South Carolina last year. They kind of rotate. Greg: Is this open to anyone? 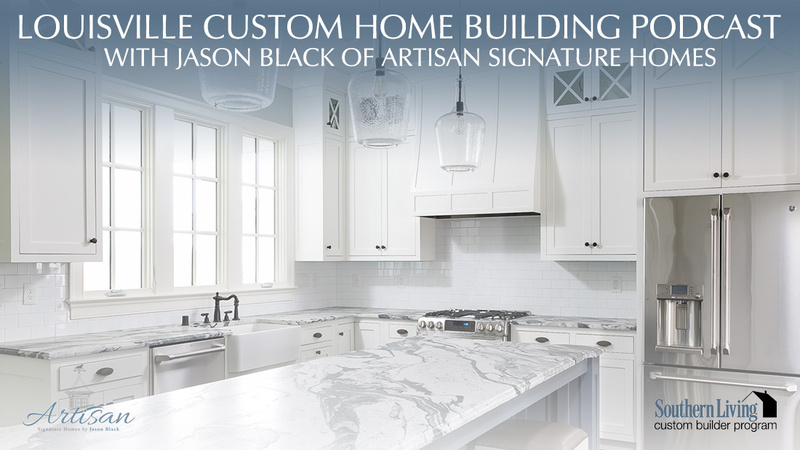 Jason: It’s usually done by southern living custom builder, which Artisan Signature Homes happens to be one of the Louisville’s members of that group. Jason: We were handpicked about … gosh, I’ve been with southern living almost 10 years now. They come and bring their folks from Birmingham, Alabama. Interview our previous clients. Make sure everybody’s happy with the work were doing, view our product, and make sure we’re a fit to wear the southern living brand. Greg: Okay, so it’s an exclusive building club? Jason: Yeah. It’s a very exclusive building club. Part of my trip to Charlottesville was to meet with … so, there’s about 100 southern living custom builders throughout the south. As a subset of that, there’s 10 builders that am part of this group. They’re probably 10 of the most forward thinking, most custom builders in the southern living program. We have a builder 10 group, that it’s called. We meet once a month. Usually we do a conference call, but maybe once a quarter or a couple times a year, we get together on site. Greg: Is this something you put together or that the larger southern living organization put together for builders or did you go above and beyond for yourself? Jason: This is … southern living kind of facilitated the group and selected the 10 to participate in this pilot program. We’ve been doing it now for a few years. Jason: They kind of coordinate it and we chose … it’s the second of the last three years that we went to the idea house. It just works to be a good spot where we can get together. Guys are from all over the south, so it’s a central meeting spot. We really get together and share ideas as to what’s working in the custom home building market and what’s not working. Greg: Okay, so I guess that the idea house, this is a look forward or a look back? Like, we did something really well that’s been done for the last couple years, or is it here’s what we think is going to be coming into the markets. You guys, the builders get a first hand look at what the the larger group, the southern living group, thinks is going to be the trend coming up. Jason: Yeah, so it’s more forward thinking. Trying to anticipate the trends of the magazine readers, subscribers, and customers for custom builders. A couple of things I saw in the southern living house that I thought were neat were they did some reclaim floors. Which is pretty big and going to be a pretty big trend lately. A big fan of trim work that I’ve done. They had a lot of shiplap walls in the southern living house. Greg: Help me out here. Jason: It’s basically white plank boards. Jason: Put it together, it kind of gives that coastal feel. A lot of the homes you see me posting on Instagram and Facebook have that very relax feel yet cozy atmosphere. One of the ways to do is with the shiplap walls. Jason: We looked at kitchen trims again. Had an awesome kitchen done by Wellborn cabinetry. It was all white, no glaze, in set cabinets. Lots of windows in the kitchen. Again, seeing more of a trend going to a sink on the outer wall with … it used to be maybe one window over the sink. Well this one had five windows over the sink. Greg: Wow. I’m having trouble picturing that. Full size windows? Jason: Yeah. Double hung windows that sit on the counter top right behind the sink. Again, letting that natural light in. In coincidentally, my southern living showcase house that I’m going to be building in Norton commons and open next spring has five windows across the back wall behind the kitchen sink. Greg: You’re setting the standard? Jason: That’s right. Again, we spent some of our time looking through the idea house. We went room by room with the builder of the house who happens to be in our group. He just kind of shared with us what the process was like. After we toured the idea house, we went and had an all day conference. We just sit down and we go through step-by-step building a house. What’s working for the guys. We’ll talk about specifications, how to specify and build your house, and make your customers happy at the same time. How can we make the specifications more detailed so there’s less confusion, less uncertainty for the end buyer, which results in less confusion and happier customers. Greg: This really doesn’t sound like its a mentor, mentee arrangement. This sounds more like a mastermind group where you’re getting some of the best builders from the best custom and luxury home builders from around the south. Who aren’t in competition with each other, right? Who are going to share the very best ideas from different markets in the best way to run a business and be a good provider of services. It’s really a mastermind group? Jason: No that’s absolutely right. In the [inaudible 00:06:20] market, I’m friends with builders, but we don’t share our most intimate secrets and our secret recipes, so to speak. Greg: That just makes sense. Jason: This group, we’re not direct competitors, so we share everything together. We share plans, we share documents, processes, and scheduling software. I’ve picked up some great resources over the past few years. We use a scheduling software that some of my fellow guys use that really keeps our projects on task. Kind of behind the scenes stuff that maybe people don’t realize what goes in. There’s so many steps to building a custom home that a lot of people think anybody can build a house. That’s probably true, but to build it right and efficiently, you got to have processes. That’s what I’ve been able to develop with the southern living group over the years. Greg: I can’t even imagine. I’ve seen smaller houses get put together. I cannot even imagine all the steps that you have putting together some of the homes I’ve seen of yours. Jason: The tricky part is doing it and doing it well. Avoid change orders, call-backs, drywall holes. You know after construction has started. The more organized we are, the better the build is and the happy the customer is at the end. Greg: Right. That’s better for everybody. Greg: I have two questions for you, if you let me jump back a little bit on the idea house. I’m curios. Is each room … was the whole house … we’ve talked in earlier podcasts how you want there to be a flow, a theme, and the whole has to work together as one unit. Is the idea house the same way, or is it the kitchen? Is the newest greatest things in the kitchen and then the bathrooms are the newest, greatest things in the bathroom, but there might not be a flow. They might be totally different styles or is this built as a residential house with flow just with he newest and greatest? Jason: It’s definitely built as one. It’s … the neat thing about this house, it was in a subdivision and Charlottesville has a different set up. There’s not mass subdivisions like there is here in Louisville. They’re spread out. This one’s on 20 acres and you can only build on two acres. The view out your back was hundreds and hundreds of acres of hillsides and pretty scenery. The house really connected well from the inside to the outside. Lots of windows. There were, gosh, probably four porches on this house. Again, it was really that connection between the inside and the outside. There’s no secret, cutting edge, modern conveniences in this house. It’s just good old fashioned architecture with good mill work, good bones that make a comfortable house. Greg: Then in your group of ten, do you all … not only do you go to see this idea house in this southern living showcase, do you look at each other’s work if your in the area? Like could you swing by one of these guys market’s and say … in the area I’d like to see some of your handiwork or vice versa? Is someone going to come through Norton commons or your showcase house next year? Jason: They all come and we’ll visit each members market. Back in May, I had a few builders come see the [inaudible 00:09:52] market. I showed them through Norton Commons. They were kind of blown away with what they saw. A lot of the builders don’t have neighborhoods quite like Norton Commons. Jason: That was pretty cool to be able to show off a little bit of what I do here. Our group will come back to Norton Commons next spring or summer. They’re either going to come to my showcase house in the Spring or they’re going to see one of my two homearama I have going next Summer in Norton Commons. Greg: Okay. Just to make sure I’m not getting my mind messed up here, the showcase house is a homearama house or is different from the homearama house. Jason: Yeah. Were going to have three separate furnished houses next year. One will have a southern living showcase house that will be in the Spring that I’ll be the only house in Norton Commons that will have the showcase. Greg: That’s before the homearama? Jason: That’s before the homearama in the Spring and then I’ll have two homearama houses that will be in July of 2016. Greg: All right. We keep talking on these podcasts and we’re teasing people. We’re talking about homes to build. Next year is going to be the year where people actually get to come through your homes and see the fine work that you do. Jason: They will. They will. Prior to that, I’ll be touring … our southern living builders we get together here in a few months. We’re going down to Birmingham to see some more houses. It’s just a great experience to see what others do and bring ideas back. One of the things we did when we were in Charlottesville is the group went to Monticello. Which folks don’t know that was Thomas Jefferson, our third president, that was his house he built. He wasn’t an architect by trade, but he was a self taught architect. The house was built well over 200 years ago, but it was amazing. The ideas that we took away from that house. Greg: It’s a cool place. Greg: Everyone needs to go. No matter what you think of the president, you need to go. Jason: You definitely do. We solved some issues that we had on a couple houses under construction of things we saw. How Jefferson did it at his house. Jason: Of sliding pocket doors back in the wall. There are just some magnificent things he did that is pretty inspiring to a builder. Greg: Can we watch along when you’re on Instagram? I noticed there were a picture or two from Monticello. If we watch Instagram, might we see maybe a year later some of the influences of your trips? Is this homework on your part? Is it just vacation while you’re talking to these guys? Jason: Any vacation I do or trip I do is always around looking at houses. I’ve always got my camera with me taking tons of pictures. I keep pretty detailed photo labyrinth on my ideas. Usually if there’s a new idea, it’s generated from one of my travel trips to Charleston, Charlottesville, or something like that. Greg: How does your new idea tie in with being a southern living custom builder? Do you have to run your plans and your ideas through their program? Is it basically once you’ve made the cut, that’s basically saying your ideas are good enough that your good to carry that title and keep building? Jason: No. Everything needs to be approved through southern living. They approve my plans on the showcase. When I’m branding with them they’ll approve the plan and make sure it’s fitting of the southern living name. Jason: They’ll want to look and make sure it’s going to represent the brand well. Greg: That is very exciting. I knew I saw some fun architecture on the Instagram feed, but I’m really looking forward to next year. I appreciate you letting me know a little bit more about southern living and how that ties into your business here in Louisville. Jason: Thanks for coming out today and again check and follow us on Instagram and Facebook. You can get a little inside look on what we do on a daily basis at Artisan. Greg: That’s wonderful. See you next week. Jason: Thanks Greg. Take care.